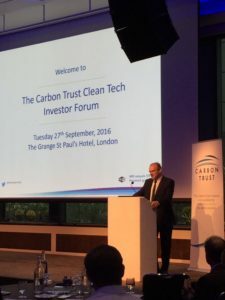 On 27th September 2016, Koru architect Issi attended the Clean Tech Investors’ Forum, organised by the Carbon Trust, holding an exhibition for PassivPod. The event was meant to promote the clean tech industry and help connect impact investors looking for innovative green projects to invest in, and connect entrepreneurs with crucial funding to grow their ventures. Issi spoke passionately to many investors and garnered a lot of interest in PassivPod and made key contacts, which was hugely encouraging and useful as we move forward.